of them is a recently cast pellet. Home is where the heart is. We have all heard this term before, but for four orphaned Eastern screech-owlets, the heart of their early existence was broken. Their home area (nest cavity and surrounding trees) was completely logged for development in late May. With no parents to raise them and teach them survival skills, they quickly came to TRC’s clinic for a helping hand. We were able to foster two with another local Eastern screech-owl family, but are still looking for a couple of other owl families to place the remaining youngsters with. Eastern screech-owlets are cavity nesters, and it is often challenging to find nest locations. Most often, they are discovered when the young fledge, hang out around the nest cavity, and vocalize near dusk, requesting a meal. If you know of an Eastern screech-owl family in the Minneapolis/St Paul area, please let us know by calling 612-624-4745 or emailing arent@umn.edu. 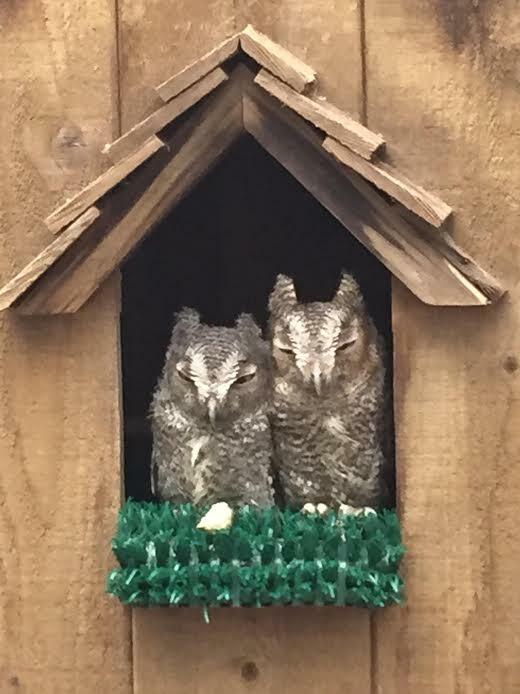 These youngsters will have the best chance of survival if they can be taught by experienced adult Eastern screech-owls. We have had great success fostering orphans with the same species, but they must be close in age to the youngsters already present. In the meantime, the owlets are living in one of TRC’s new outdoor rehabilitation pens, and recently fledged from the cavity they were provided. The little “hutch” was used formerly by our education department for one of our winged ambassadors, so we are recycling it for clinic use. 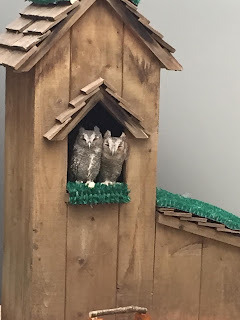 The owlets will begin “mouse school” soon if not fostered (in which the owlets are presented with opportunities to hone their hunting skills with live prey in a controlled setting), and will have to stay with TRC for a while as they improve their hunting and flying skills. Their temporary home may be at TRC, but their hearts will forever remain wild.